When at work or writing at home for groovyPost, one of my favorite things to do in the background is listen to music. It helps focus my thoughts and stay in the groove (so to speak.) A few months back after hearing my music collection a few million times, I decided I needed a change. I am sure some of you groovyReaders have had the same experience right? But where do you go to get great music? Radio? Internet radio stream? Nahhh. Once again just more boring, repeating tracks and commentary. Fortunately, I have a groovy FREE solution for you; it’s called Pandora.com, and it works for both MAC, Windows and iPhone users! Okay, enough talk! Let’s listen to some groovy music! 1. 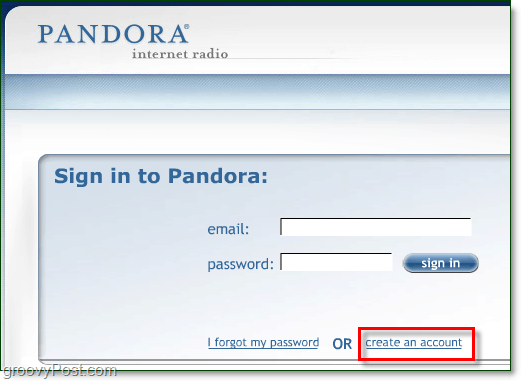 Using your Internet browser, visit http://www.pandora.com/, and you get to the main page. 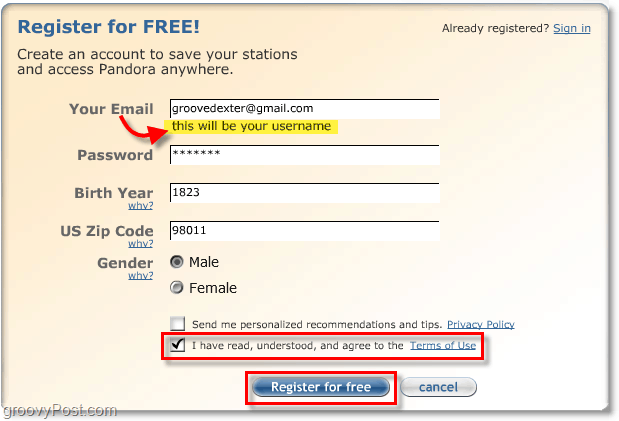 To use Pandora you’ll need to register an account, but don’t worry – it’s free! Click create an account. 2. Registration is simple, just use an email address and password you’ll remember. Your email address will be your user name for when you want to pull up your personalized music later on. Here’s the fun part! If you’re a fan of popular sites like StumbleUpon, then you’re already familiar with interest-based recommendation engines. Pandora uses the Music Genome Project to pull up randomly generated playlists of music that are similar to a song or artist you gave a thumbs up to. The only catch is, Pandora may or may not play the song you typed in, so it’s kind of like opening up a box of chocolates; you never know know what your gonna get. Then again, more times than not, Pandora always manages to find exactly what I’m looking for even if I’ve never heard the song or artist before. Yeah, Very Groovy! 3. Type in the name of the Artist or Song that you like, and then Click Listen Now. 4. 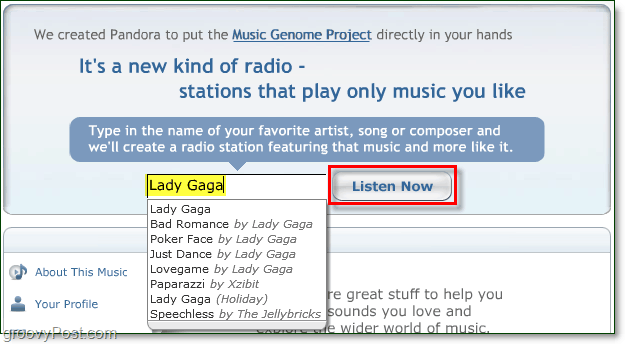 Now Pandora will set up your station and start playing your Song/Artist or ones that are similar. What makes Pandora beautiful is that it allows you to be Caesar in the Roman musical coliseum. 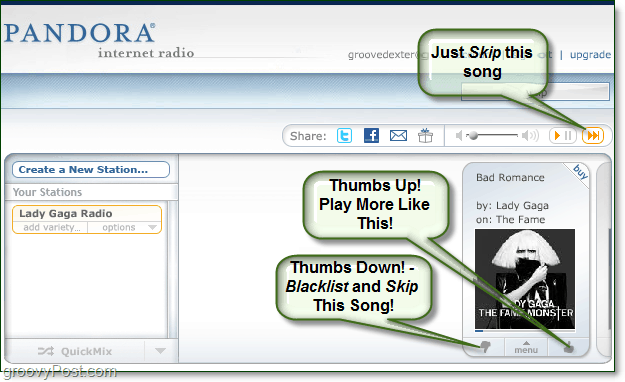 You can give songs the Thumbs Up, and Pandora will play it and more songs like it more often. On the other hand, you can give songs the Thumbs Down and Pandora will blacklist that song from your station and avoid playing songs that are too similar to it, though similar songs will eventually still play. 5. Once you get tired of listening to your original station, you can create new ones. Just Click Create a New Station, and you’ll be prompted to type in a new artist or song. 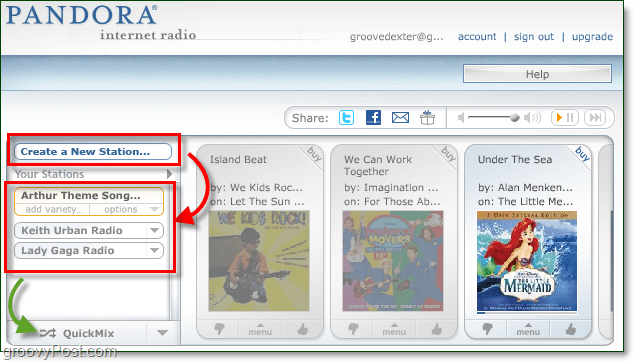 To mix things up even further you can Click Quick Mix, and it will play a mix of song types from all of your stations for an entirely dynamic and customized music experience. Have you listened to some groovy tunes on Pandora? What did you think of the service? Do you prefer a different service? Would love to hear about it in the comments! I love Pandora, listen to it on my iPhone ALL day at work every single day. I don’t think they limit the iPhone app to 40 hours a month because I know I go waaaay over that and haven’t seen a message on it. Didn’t know about the quick-mix – Thanks for the tip! @junglebook – Thnx for the info on the iPhone. I use it on my MAC but I went ahead and bought the full version so I obviously don’t ever hit a limit. Sounds like Pandora could be an excellent source for a new music experience. Unfortunately, due to licensing constraints, people outside of the U.S. (I live in Canada) are not eligible for this service. Very disappointing. Glad to have been of some service. Still, it would be nice if Pandora was available to Canadians. I guess I will have to make do with the standard internet radio stuff. There are a few other options besides Pandora that are pretty swell. One is Last.fm which has some of the same features and is also a nice way to find new music. Two other choices are Grooveshark (I mean come on it has groove in the name) and also Lala. Grooveshark in particular gets consistent high ratings from users. Last.FM is pretty good, and I’m working on a review of grooveshark as well – it IS groovy! First off great site! I check back here often but I was hoping if one of you could give me a little pointers. I happened to stumble upon a site that offers a lot of free music and claim they pay their members for uploading but has somebody here tried them out? I think the site was http://www.mediahunt.org but I’m not 100% sure. Thanks for any pointers you can hook me up with. @Micheal – Have you tried out http://grooveshark.com/ ?